Emulsion paints. 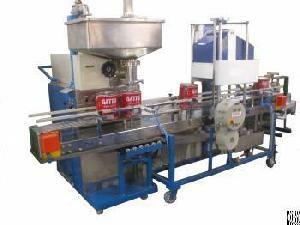 The machine can be configured with a Weighmetric Filling system or with Volumetric Filling System. The weighmetric machine can fill from 1 litre to 20 litres and the Online Lid pressing system is suitable for Plastic containers as well as for Metal cans.